What's the best-selling classical album? The Titanic soundtrack has moved people for decades - and now the score has come top of a list of the best-selling classical albums of the past 25 years. James Horner, who died in 2015, composed the soundtrack, which has sold more than a million copies in the UK. It was named top of the Ultimate Classic FM Chart, the biggest countdown of classical music sales. British singer Russell Watson claimed the second and third slots on the list with albums The Voice and Encore. He's also the most popular male artist, with almost 2.5 million album sales. Overall, Welsh Mezzo-Soprano Katherine Jenkins is the number one classical music artist of the past 25 years - selling more than 2.7 million albums on the Classic FM chart. Her albums Living a Dream and Second Nature both feature in the top 10, at six and seven respectively. She said: "I was 12 when Classic FM was launched and I feel like we have grown up together. "I listened as a child, so it was a huge moment for me when they first played my song on the radio - and when they announced my first number one, I remember bursting into tears." Jenkins said being the number one artist is "something I will treasure always", adding: "I hope you can hear the cheering all the way from Neath!" She is not the only Welsh success on the list. Seven out of the top 20 albums are by Welsh artists and six out of the top 20 best-selling artists are from the country. Joining Jenkins on that list are Charlotte Church, the Fron Male Voice Choir, Bryn Terfel, Aled Jones and Sir Karl Jenkins. The chart was compiled by the Official Charts Company, based on UK music sales data. It covers the top 300 albums released since 7 September 1992 - the day Classic FM launched. Sarah Horner, widow of the Titanic composer who died in a 2015 plane crash, told the radio station: "Touching the inner world of the audience was what most composers wish to do, and when he was successful at doing that, I think James felt like he had fulfilled his destiny." 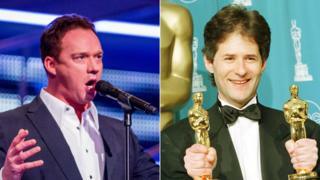 The soundtrack won Oscars for best original dramatic score for Horner and also best original song, along with lyricist Will Jennings, for Celine Dion's My Heart Will Go On. Andre Rieu was named the biggest international classical artist, with nearly 2.3 million album sales - and 11 albums in the chart in total, the most of any artist. He said: "Ever since Forever Vienna became my first UK number one album eight years ago, the support from the British public has been incredible. I could not ask for more enthusiastic and loyal fans."